An experimental positron emission tomography (PET) tracer can effectively diagnose concussion-related brain degeneration while a person is still alive, according to a proof-of-concept study conducted at the Icahn School of Medicine at Mount Sinai and published September 27 in the journal Translational Psychiatry. Mount Sinai researchers used an experimental imaging agent called [18 F]-T807 (or Avid 1451) with PET to examine the brain of a living, 39-year-old retired National Football League (NFL) player who had experienced 22 concussions and exhibited clinical symptoms consistent with chronic traumatic encephalopathy (CTE), a neurodegenerative brain disease that has been associated with repetitive blows to the head in athletes and soldiers. T807 is designed to latch onto a protein called tau that accumulates in the brain as a result of repetitive traumatic brain injury. When the new imaging agent (or ligand) lights up a PET scan of the brain of a patient showing buildup of tau in a characteristic pattern, the scan result is interpreted as being consistent with CTE. Until now, evidence for CTE pathology has only been possible by examining brain tissue after death. CTE has a distinctive pattern of tau deposition that was described in 2015 by an expert panel commissioned by the National Institute of Neurological Disorders and Stroke (NINDS). That panel laid out diagnostic criteria for CTE based on samples of postmortem brain tissue. The surface of the brain is highly wrinkled. The tau accumulation in CTE appears to trace the highly folded surface of the brain and is especially concentrated at the deepest points in the wrinkles and folds. The NINDS panel used the word “pathognomonic” to describe the CTE tau pathology pattern. This is a technical term that indicates that whenever you see this pattern of tau pathology, the diagnosis can be nothing other than CTE. There can be no confusion with other tau diseases. A link between brain injury and long-term health has gained greater attention in recent years, helped along by evidence of neurofibrillary tangles of tau protein, or tauopathy, that has been clinically confirmed in the postmortem brain tissue of former athletes and soldiers with histories of multiple head traumas. In addition to symptoms such as irritability and extreme mood swings, CTE is associated with the symptoms of various other neurodegenerative diseases, including Alzheimer’s, Parkinson’s and Lou Gehrig’s diseases. Under the leadership of Drs. 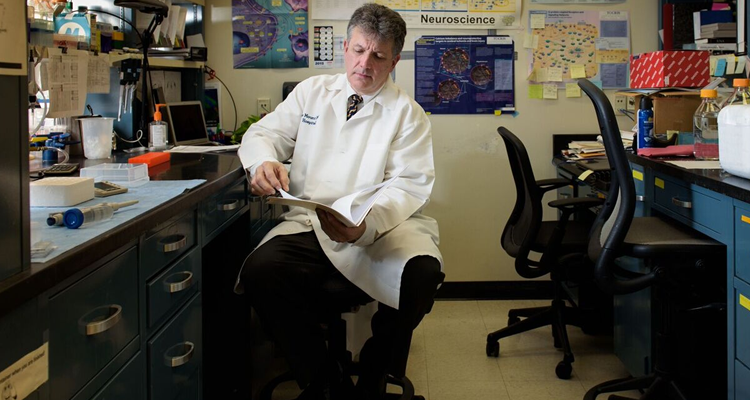 Gandy and Dickstein, and with primary funding support from the Alzheimer’s Drug Discovery Foundation (ADDF), Mount Sinai is one of the few medical centers researching the use of the new ligand in living patients who are believed to have CTE. The Mount Sinai team is currently studying 24 patients and plans to establish a clinical trial early next year that will employ the new ligand to identify CTE patients who might respond to an anti-tauopathy medicine that is currently being studied at other medical centers for the treatment of Alzheimer’s disease and other neurodegenerative disorders.